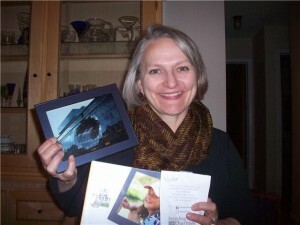 You are currently browsing the Recycling for Charities blog archives for April, 2010. Let’s face it- Michigan weather is never predictable! 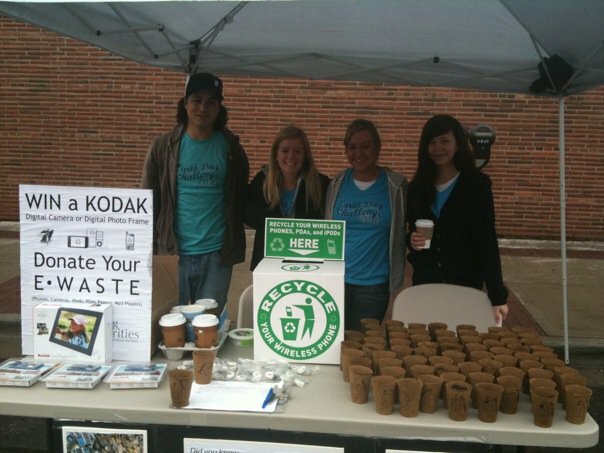 While the rain continued to come down on April 25, it didn’t stop brave participants from joining Recycling for Charities at the Recycle Royal Oak event. 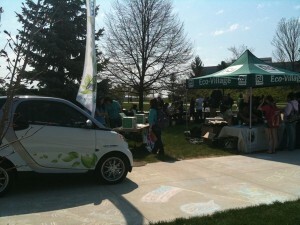 Many families fearlessly made their way to the different green stations set up in downtown Royal Oak for the event. Make and take crafts were provided by Arts & Scraps, SOCRRA had recycling bins on site for sale, and OUR Credit Union provided free document shredding. 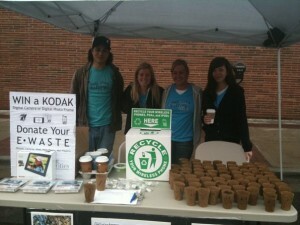 And of course RFC was there to collect e-waste from community members! For being so green those who donated were able to sign up to win a free Digital Camera or Digital Photo Frame, provided by Kodak. Below are our winners, who we thank again for taking the time and braving the rain to donate! Through RFC’s Earth Day events, and with the help of local participating businesses, we were able to collect over 150 electronic waste items for recycling. Imagine if this e-waste had been thrown out, ending up in our landfills with the chemicals possibly seeping into local ground water! Not only were we able to save these electronics from affecting our environment but we also helped raise funds for two worthy non-profits, the Hospice of Michigan and the Oakland Land Conservancy. 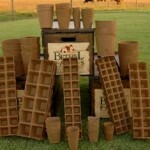 RFC was also able to give away the ever popular biodegradable pots with planted vegetable seeds! Over 150 pots were handed out at our Earth Day events, many to kids who were excited to get their gardens started right away! From communicating with possible partners to placing donation requests so that participants did not walk away empty handed at events, Winter Greenterns Jenny and Katie were involved with the entire event planning process. The Greenterns spent time writing press releases, contacting media sources, spreading awareness through social media, and convincing local businesses to help our green cause! But most importantly Jenny and Katie were able to see how a non-profit organization functions behind the scenes and gained real job experience. 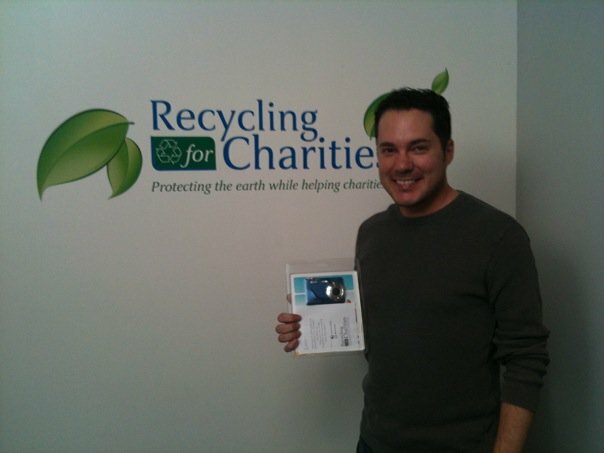 It also didn’t hurt that they worked in a fun and energetic setting at the Recycling for Charities office! A special thanks to all donors and participating businesses who had to put up with weekly intern visits and calls! We truly appreciate your support: AlexEmilio Salon, Bean and Leaf Café, Bethel Farms, Café Muse, Douglas J Salon, Nutri-Foods, Scout, Siegers Seed Co., Shine, TASI Juice Bar, and Titzy’s. The strong bond between animals and the environment is undeniable, but is often disregarded when it comes to keeping our land and water pollution-free. One cell phone alone, if thrown away, can pollute 40,000 gallons of ground water, which in turn affects the nearby wildlife. While the mission of Friends For the Dearborn Animal Shelter is to provide loving care and sanctuary to animals that are neglected, Recycling for Charities hopes to help in a similar way by making sure e-waste stays out of landfills and in turn keeping ground water clean for wildlife. Last year alone the shelter took in over 2,500 animals, many of whom were extracted from hoarding situations or were surrendered due to the poor economy affecting the state of Michigan. 65 percent of these animals were saved by the Dearborn Animal Shelter which is astounding considering that the national average of animals which are received and euthanized by shelters is 70 percent. You can help the private, non-profit organization Friends For the Dearborn Animal Shelter by joining them to celebrate the 5th Annual Mutt Strut & Pet Expo. The pledge-driven dog walk and community-wide celebration will take place at Dearborn’s Ford Field, with lots of entertainment, shopping, and fun focused on pets and their families. It will take place May 15 and 16 from 10 a.m.-3 p.m. at Dearborn’s Ford Field— rain or shine or snow – all weather is dog weather! Participants will be able to bring their broken and used wireless electronics, such as cell phones, PDAs, MP3 players, iPods, iPhones, pagers, and digital cameras, to be recycled. All of the proceeds from the recycled e-waste will in turn go back to the Friends for the Dearborn Animal Shelter who can use it to care for the animals they rescue. If you have no e-waste to contribute you can also make a monetary donation. According to the shelter just $25 would provide an orphan kitten or puppy with special formula for 9 days. Friends For the Dearborn Animal Shelter is dedicated to their mission of helping both homeless and owned animals, whether it be through care or adoption. You can help their passionate cause by visiting their website at www.dearborn-animals.com and can learn how to get involved with the Mutt Strut & Pet Expo at www.dearbornmuttstrut.com.